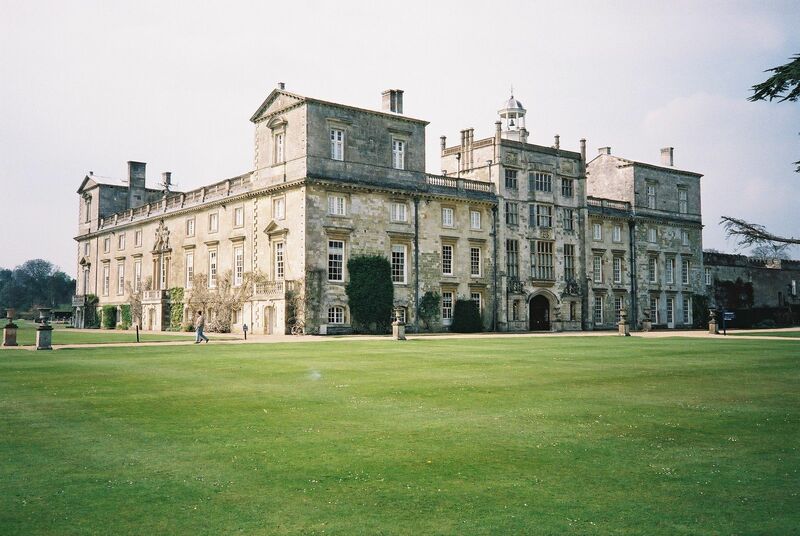 Wilton House, at the village of Wilton, just W of Salisbury, Wiltshire. See wider map and close-up satellite view. See other map. The house is on the N bank of the River Nadder. A Catalogue of the paintings & drawings in the collection at Wilton House, Salisbury, Wiltshire, 16th Earl of Pembroke, 1968, [TCD] 708.23 WIL +K8, [EUL] F.7082 Pem. 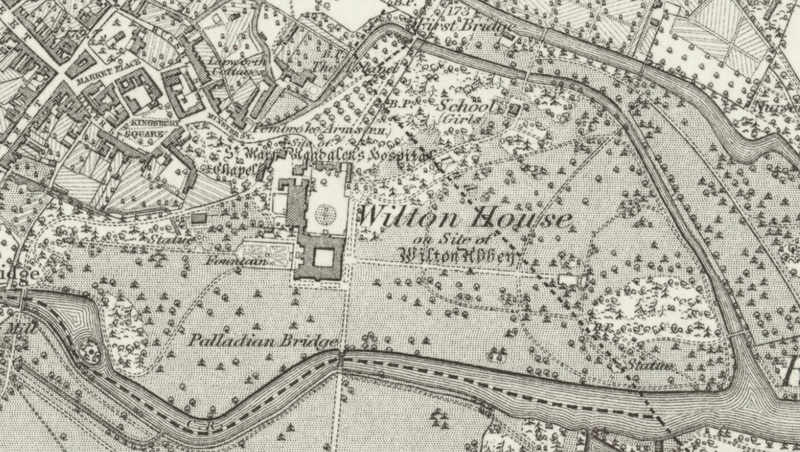 Guide book to Wilton House, pub during time of the 15th Earl (pre-1960). 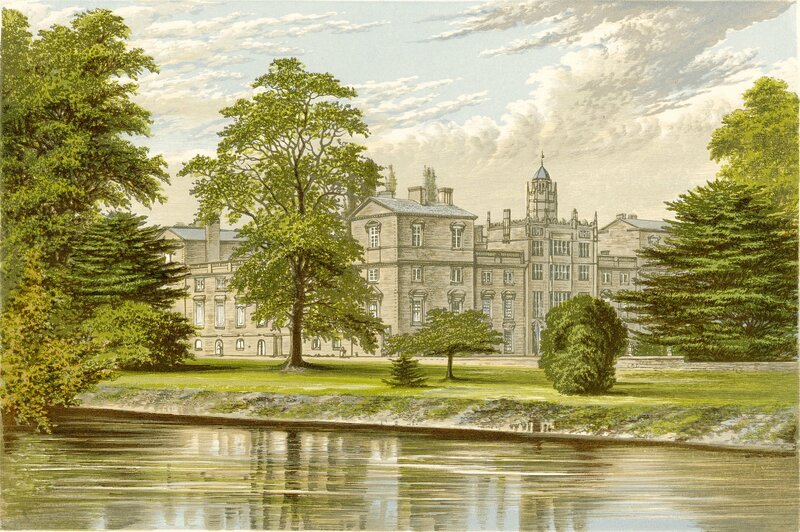 Wilton house pictures, by the 14th Earl of Pembroke and Sir Nevile Wilkinson, 1907. Wilton in Fifteen Famous English Homes, Randolph Spencer Churchill, 1954, [EUL] 7288(42) Chu. Wilton in The Renaissance Garden in England, Roy Strong, 1979. Photo 2003. See full size. Wilton Abbey was originally a 9th century nunnery. Replaced by 12th century Abbey. Benedictine nuns. Wilton Abbey was dissolved 1536 in the Dissolution of the Monasteries. It was granted to 1st Earl of Pembroke by 1544. He built the first Wilton House 1540s. 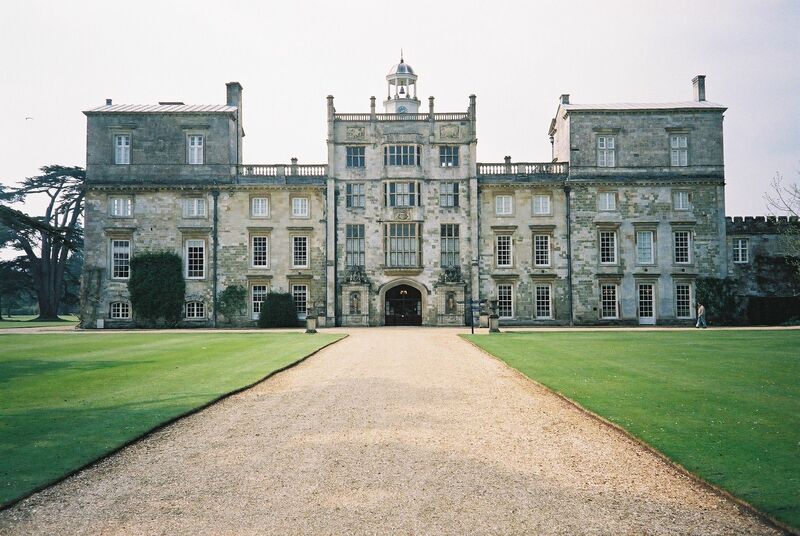 Wilton House was rebuilt by 4th Earl of Pembroke from 1635. He set up formal gardens, and planted the Cedars of Lebanon. 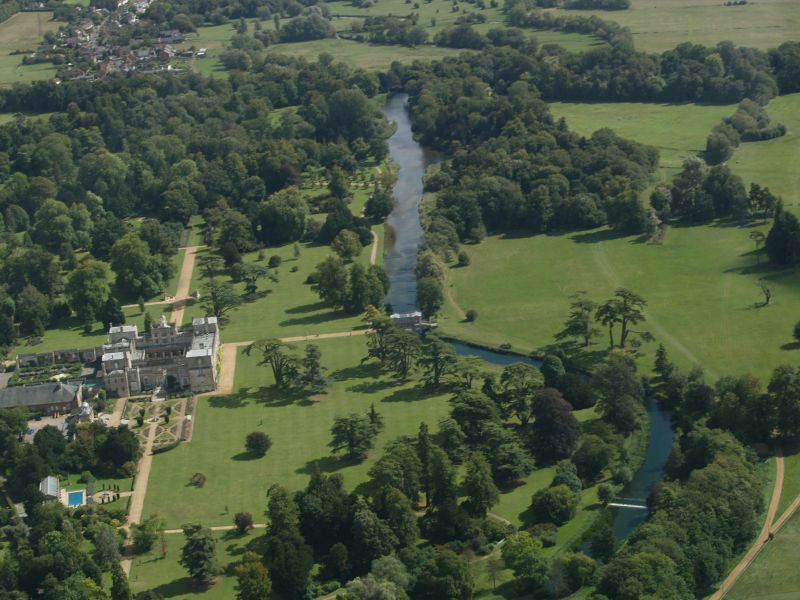 Formal gardens removed, and grounds landscaped by 9th Earl in mid-1700s. He built the Palladian Bridge 1737. The Riding School was built by 10th Earl 1755. Wilton altered by 11th Earl 1801-16. Gardens and fountains added by 17th Earl. Wilton is still seat of Earl of Pembroke. From 1887 map. Surveyed 1877 to 1879. Entrance to N. Palladian Bridge to S.
Click to toggle map/satellite view. Click to zoom in/out. Drag to move. See street view of N entrance. 3D view from Google Maps. 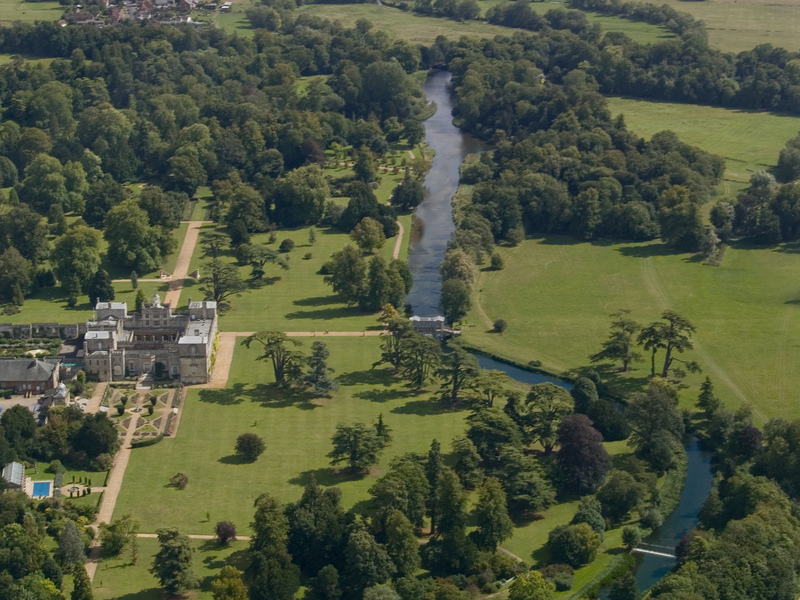 Wilton House from the air. From the W.
From Neil Gotadoro. Used with permission. From Liam Quin's "Pictures From Old Books" site. Wilton House. S facade on left, E facade on right. 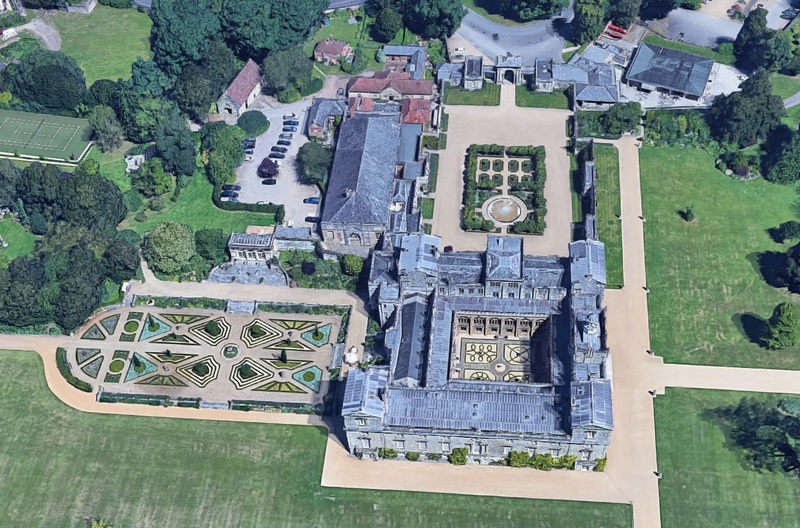 Wilton House from a drone. Many movie scenes have been shot in Wilton. Movies especially like using the Double Cube Room with group portrait. Romance with a Double Bass (1974) written by John Cleese. Barry Lyndon (1975) by Stanley Kubrick. Includes outdoor scene of S front from river with Palladian Bridge, also Double Cube Room with group portrait, all before opening credits. A Voyage Round my Father (1982) by John Mortimer. The Bounty (1984) with Mel Gibson and Anthony Hopkins. The Madness of King George (1994). Sense and Sensibility (1995) with Emma Thompson. Includes ball scene in Double Cube Room with group portrait. Has Queen Victoria at her desk, in Double Cube Room with group portrait. Pride & Prejudice (2005) with Keira Knightley. The Double Cube Room with group portrait stands in for the interior of Mr. Darcy's house Pemberley. Includes dinner in Double Cube Room with group portrait. Also shots of Cedars of Lebanon outside, Palladian Bridge, and scenes in the Large Smoking Room. Double Cube Room used for Buckingham Palace interior. Clip from The Bounty (1984). Shows Double Cube Room with group portrait. The ball scene in Sense and Sensibility (1995). Filming of Pride & Prejudice (2005) at Wilton and other locations. The Pembroke Arms (bar and restaurant and guesthouse), just opposite Wilton House, Wilton village. See street view.